One of the first announcements of Prime Minister May’s tenure was that the Government would introduce an Industrial Strategy to ‘allow the UK to build a long-term economic plan’. Quite rightly, this announcement has generally been welcomed by business leaders and economic development commentators. Not least because having a long-term economic plan will to some extent shield the UK from the inevitable battering from the storm winds that will follow Brexit. The country needs an economic strategy that goes beyond continual devaluation and weakening of the currency. The announcement of the adoption of an Industrial Strategy also marks a departure from the previous stance of the former Business Secretary, Sajid Javid. Javid is an avid free marketeer and had demonstrably snubbed the approach of his predecessor, Vince Cable, in developing an industrial strategy that extolled the UK’s expertise and innovation in driving forward the ‘eight great technologies’ – http://tinyurl.com/othjsw5. It is not clear how, without an industrial strategy or economic plan that Javid intended to help places like his home town of Rochdale. He could have done worse than follow the lead of the Regional Development Agencies that were abolished by the Coalition Government. 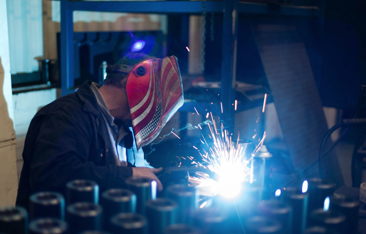 The evidence demonstrates that the key factor in determining the UK productivity gap is investment – investment in infrastructure, investment in technology, investment in plant & equipment, investment in skills. This was quite starkly illustrated recently at the launch of the Northern Powerhouse Independent Economic Review which consultants SQW led supported by a large team of consultants and academics. 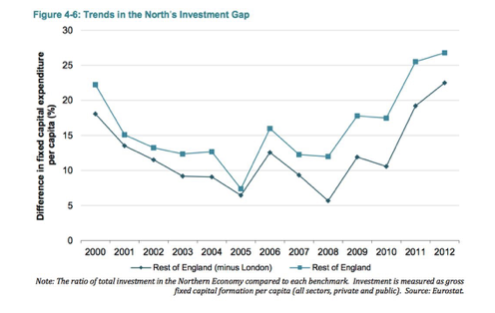 The graph of the North’s Investment Gap shows that the gap was closing during the period prior to the financial crisis when the norther RDA’s were making significant investments and matching European funding to enhance the impact of that investment. In order to improve the relative economic performance of the Northern Powerhouse there has to be a step change in investment to run in parallel and support the emerging Industrial Strategy.